If you look at a pro volleyball player, you'll see some serious muscle. Strong quads, flexible and functional hamstrings, and powerful glutes--male and female players alike, good volleyball players are so strong, it shows. Volleyball is a tough sport, demanding speed, agility, and explosiveness all in one athlete. Ask any pro where they built those traits, and they'll tell you: in the weight room. Strength training is beneficial for most sports, but essential for volleyball athletes. Even though there are many specific skills necessary for success, you cannot build these skills without a solid foundation of strength. Lifting--even for young athletes just starting their athletic career--is a crucial training tool for building that strength foundation needed to out-jump, out-cut, and out-sprint opponents. 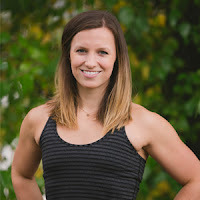 Here are my top 3 reasons volleyball players should spend more time in the weight room--now! It may seem like a no-brainer, but if you want to be a strong and powerful player, resistance training is how to do it. 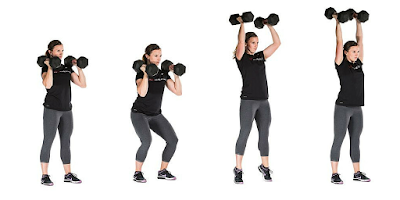 Lifting weights stimulates muscle fibers to grow in size (hypertrophy), to produce more force per contraction (strength), and to fire at faster rates (power). How does lifting do this? The push press helps develop powerful hip extension in concert with explosive shoulder and upper-back strength. This exercise is an especially good choice for volleyball athletes, and will help strengthen the muscles most often used in setting and spiking the ball. Training overhead movements is essential for maintaining healthy shoulder and rotator cuff function in overhead athletes.Not to get too technical, but there are several changes that take place within muscle cells (also called fibers) after beginning a strength training program. The first (and arguably most influential) changes that occur are neuromuscular, involving the connection between your muscles and your brain. In order for your biceps to contract, for example, your brain must first send a signal to all the individual fibers in the biceps muscle to call them into action. When you first start strength training, only some of your muscle fibers will respond to your brain's request for activation. But as you continue to challenge these fibers through strength training, more and more muscle fibers will be activated. BB Front Squat - Training core stability and dynamic leg strength, the front squat works the muscles involved in safe jumping and landing technique, while strengthening the lower back and core musculature to prevent injury during game play. Think of it this way: lifting a heavy weight is kind of like drinking a thick milkshake through a small straw. If you only use one straw, it will take you a long time to drink the whole shake. But if you can use, say, 100 straws at once, you'll get a greater volume of shake with each sip. This is similar to what happens when all of your muscle fibers are trained to be activated at once--you can lift more weight (milkshake) more efficiently. This translates to more strength in the weight room, and more explosive power on the court. Only muscle fibers that are directly stimulated through the stress of strength training will grow, which makes lifting an athlete's best tool for developing the power to jump higher, and serve more forcefully. With all the jumping, landing, cutting, and planting in volleyball, the body can take a beating. 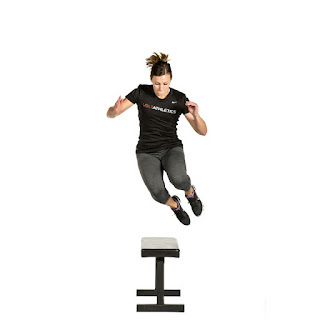 Every time you jump, the force of the landing is transferred through the ankles, knees, hips, and back. It's no wonder so many volleyball athletes have back pain! Research has proven again and again that the best method of injury prevention is strength training. And it makes sense: strong muscles are better able to absorb the shock of landing, or changing directions quickly, better than weak muscles. BB Lunge - Emphasizing single-leg strength, the lunge helps build core and leg strength needed for unilateral movement and balance. Unilateral training helps ensure athletes build balanced strength, which aids in injury prevention. Starting a strength training program helps prevent injuries in two big ways: first, by strengthening the targeted muscles used in volleyball (quads, glutes, hamstrings, calves, hip flexors, shoulders, etc.). Strong muscles get the job done better than weak ones. But a good training program will also help athletes develop a foundation of balanced strength. Injuries in young athletes are usually caused by overuse (which can be prevented with a good coach and training program) and muscular imbalances. That is, if your quads are much stronger than your hamstrings, or your biceps much stronger than your triceps, you're going to run into trouble. Weight training helps even out imbalances from front to back, head to toe, and left to right. Lifting ensures that athletes are paying as much attention to their abdominals as they are to their lower back muscles, and so on. The best athletes are healthy athletes, and strength training can help players avoid injury through developing 3-D, balanced strength. 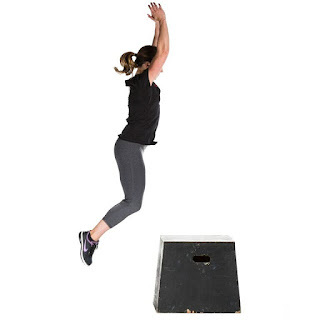 DB Box Jump - The box jump is a great way to develop and train explosiveness while practicing safe jumping and landing technique. Developing dynamic and explosive hip extension is crucial for volleyball players. This may not seem like an obvious benefit to starting a strength training program, but seriously: lifting weights helps cultivate a healthy, positive team culture. Volleyball isn't a solo sport--even in pairs volleyball, you have to be able to rely on your teammate in competition. The weight room is a great place to practice working hard as a team. When your entire team is in the weight room together, it can be a unique opportunity for team growth. Not only are athletes united in their goal (to finish the workout) much like they are in actual gameplay, they are participating in an encouraging--but still competitive--team environment. When your teammate is struggling with a lift, it opens up space for others to step forward and motivate them. And when you're lifting side by side with a teammate, it can facilitate a healthy competitive drive among friends. And the actual physical act of lifting heavy weight, because it is innately difficult, helps to build individual mental toughness. All these traits translate onto the court during competition, when players must trust their teammates, create a positive mental space for themselves, and persevere. Box JumpsThe next time you see a pro volleyball player, look closely: you'll see strong quads and glutes, for sure--but you might also glimpse that inner strength that separates great athletes from good ones. Starting a strength training program, even at an early age, can help you develop the strength needed to excel at volleyball--both inside and out. Disclaimer: Any training advice given is intended for informational purposes only. While strength training is appropriate for athletes of all ages with proper supervision, training for maximum strength is appropriate only for adolescents and up, due to risk of injury to the epiphyseal bone plate. Always consult with a doctor or pediatrician before beginning any exercise program.